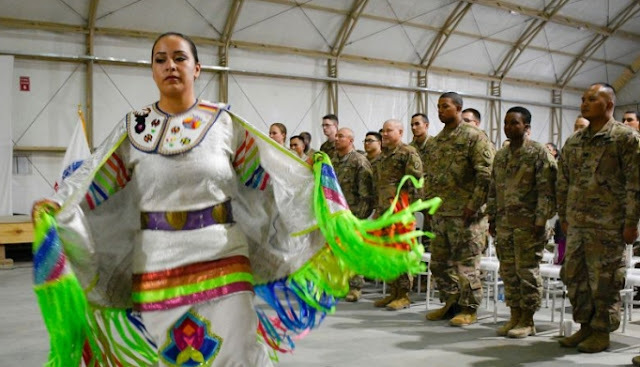 Soldiers beat heavy thumps on a traditional buffalo-hide drum as an Army private danced in her rainbow-colored dress at a powwow at Camp Buehring in Kuwait. 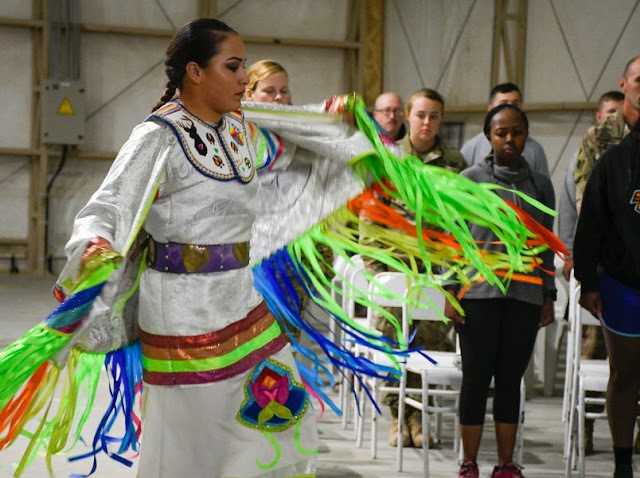 The powwow Tuesday was a chance for deployed Native American soldiers to honor their heritage and share it with others, said Capt. Warren Queton, a member of the Kiowa nation and the commander of the 1245th Transportation Company out of Oklahoma. In August, members of Oklahoma City University’s Native American Society donated their drum to allow National Guardsmen deploying from their state to have a powwow in Kuwait. About 9,000 Native Americans serve in the armed forces. They have the highest number of servicemembers per capita compared to other ethnic groups, according to military statistics. 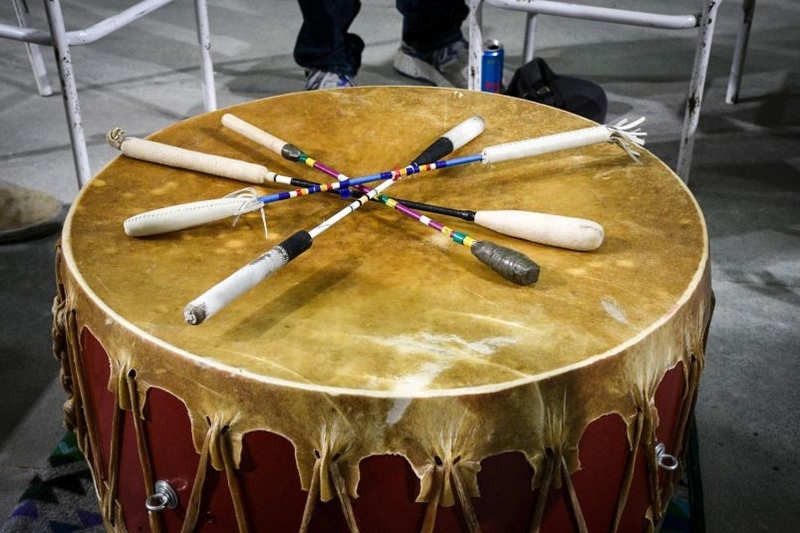 The powwow was a chance to show the importance of the American Indian identity, said Pfc. Tayshaun Mingo, 21, from the 114th Field Artillery Regiment. 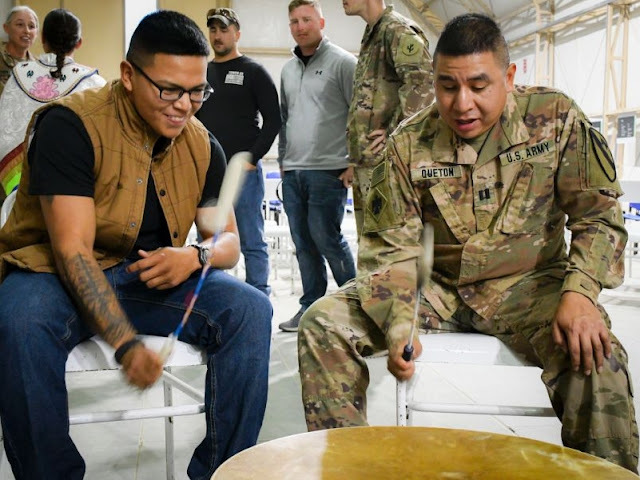 Mingo, a member of the Choctaw tribe, said he grew up attending powwows but didn’t think he’d be the drummer at one so far away from his home in Kansas. “I didn’t expect to be doing a powwow in Kuwait,” he said. One of the dancers, Army Pfc. Loretta Menchaca, 21, had her white dress with streaming rainbow fringe shipped to Kuwait from her hometown of Keshena, Wis. The day of the dance, she peeked out the door of the hangar at the soldiers walking in for the ceremony. She usually doesn’t talk to people about being Native American, said Menchaca, a cook with the 395th Ordnance Company out of Wisconsin. The prospect of telling everyone — through dance — about her heritage as a member of the Menominee nation made her nervous. Then she whirled around the drum as Queton and others beat a steady rhythm for several dances. “I started dancing when I could walk, I’ve been dancing for about 21 years,” Menchaca said. Near the end of the ceremony, Menchaca invited other soldiers to join a friendship round dance, in which men and women lock their arms and shuffle in a circle in time to the beat. She led them through the steps, with the soldiers mimicking her, with varying levels of success. She hugged her friends after the final beat of the last dance. No longer nervous, Menchaca said she was glad, because she was able to educate others about her heritage. Responses to "Native American soldiers celebrate their heritage at powwow in Kuwait "
It is digusting! There are also sellouts in the Native American community fighting now for Imperialism! Shame, shame!